Living large is easy at the ultra-luxe Villa Haleana. 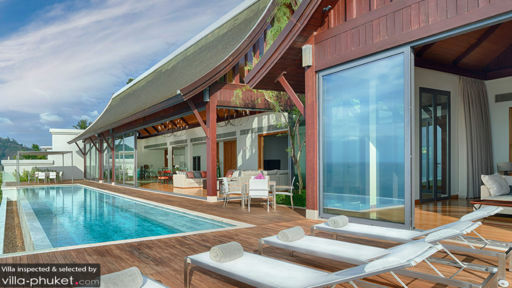 This glamorous vacation rental, housed in the exclusive Malaiwana estate is a holiday dream come true with its uninterrupted sea views, infinity pool and immaculate living spaces. 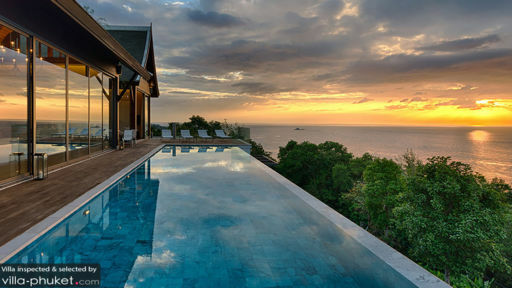 Set close to the coasts of Nai Thorn Beach, Villa Haleana makes a great base for exploring northwest Phuket - a lesser-known region that boasts pristine beaches and spectacular tropical landscapes. Five bedrooms, comprising of two master suites and three guest bedrooms are spread out across the compound. The first master bedroom, set on the top floor offers sea views and direct pool access. Furnishings include a king bed, flat screen TV, loveseat and bookshelf. A spacious walk-in dressing area (complete with warm lighting and vanity) feels incredibly luxurious - as does the marble-clad en suite with terrazzo tub, double vanity and shower recess. An adjacent media may be converted into a kids room to accommodate families with young children. The second master bedroom oozes with its marble entry hallway. A private balcony extending out from the room overlooks the ocean and beach, and the interior is made cosy and comfy with a king bed, loveseat and desk. The attached en suite is impeccably furnished, featuring a spacious tub, shower recess, double vanity and twin toilets. All three guest bedrooms are located on the ground floor. Each is outfitted with king beds (may be converted to twins), en suite bathrooms with double vanity and shower recess and balconies with sea views. The first outdoor feature that catches your eye is the 18-metre infinity pool hugging to the edge of the property. Sparkling under the sun, its allure is irresistible through the day - particularly in the afternoon, when the heat of the tropics is at its peak. Sun seekers will enjoy cosying up on the loungers (when they’re not taking a dip), and the pool deck also comes outfitted with an outdoor dining set for eight. Sunlight spills into the cavernous common area to create interiors that are bright and airy. Glass walls and sliding doors surround the living spaces, drawing your eyes out to the incredible coastal scenery beyond. While the peak-roofed pavilions are inspired by traditional Thai designs, the interiors are modern with marble, polished wood and contemporary furnishings. Gorgeous chandeliers and amber lighting cast a warm glow within, adding on to the home’s warm, inviting ambience. Set in an open layout, the living spaces contain an indoor lounge, 12-seater dining room, guest kitchen with breakfast bar, two media rooms, spa room, study and gym. With large living spaces, exceptional entertainment facilities and well-landscaped outdoor compound, Villa Haleana makes a great venue for hosting weddings and events. There is a maximum capacity of 80 people, and an event fee applies. With a team of full-time housekeeping staff, a Thai chef and villa manager, all your vacation needs are well-attended to at Villa Haleana. Breakfast, lunch and dinner are prepared by your chef, and menus will be catered to specific dietary requirements where possible. Professional beauty and wellness therapists may be engaged at additional cost for in-house spa rituals. Your villa manager will assist with rental of kids equipment at additional cost. It’s three minutes’ drive to Nai Thon Beach. This lesser-known beach boasts a laidback vibe and a swathe of soft sand lapped by turquoise waters. It’s great for sunbathing, snorkeling and stand up paddling. Round up a day at the beach with a seafood feast from one of the seaside vendors dotted along the coast. 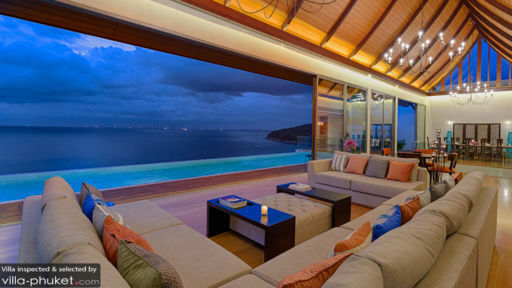 Fabulous dining options are scattered all around your villa. Trisara Resort is a six-minute drive away, Anantara Layan Phuket Resort is 10 minutes by car and a 15-minute drive away are a variety of seafront restaurants stretched out along Bang Tao Beach. It’s 10 minutes’ drive to Dream Beach Club, a chic venue for sundowners.